You know I’ve been writing about how all this law of attraction stuff has been working and how I believe you can make it happen in your life. Well, for a long while my son, Dennis, had both feet in the waters of disbelief, mainly because like most, his thoughts attracted that. Last Wednesday we all decided to get on our bikes and ride down to a place here in Naples, Florida called Venetian Village. It’s a set of shops on the back waters here complete with a Ben and Jerry’s. We went along with Anna our neighbor, and Dennis. While there, I had time to talk with Anna about things happening, or not happening in her life. And we both realized that the further you get away from listening and believing in the laws of the universe and God, the more doubt pops in your head and dominates. I told her that it’s a slippery slope to depression. When we came back, we made dinner, and Dennis (who lives right around the block) and Anna joined us. I thought it would be a great time to show The Secret after dinner. We all gathered around the TV set and watched the whole thing. I knew Dennis had never seen it. Later he asked some questions about it. Parts of it made a lot of sense. For the next few days he decided to filter his thoughts. Stuff started happening. His days were better. Last night he intended to broadcast live (he’s a lifecaster on www.Justin.tv/kioken) from the Apple store close to his home, because today Apple launched their iPad. He thought he’d get in line and simply have some fun and show everyone the new gadget. Yet into the broadcast last night, he decided to put the law of attraction to the test. Arnaud Mueller, a fellow lifecaster and friend encouraged him and encouraged viewers to participate. Dennis thought why not stay up ALL night and raise money to buy one of these things? It was known that the stores would have around 5 or so allocated to the first people through the doors in the morning. Dennis had a few dollars in his account and some cash. How could this happen? It would take a miracle, no? 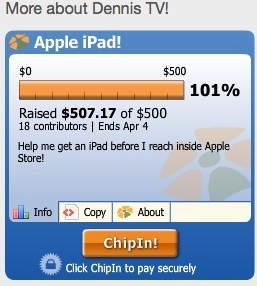 The iPad is $500! Through the night he broadcast. The donations started coming in to his PayPal account. First $5, then $15, $20. Soon, it was near $400. As the night went on, Dennis didn’t let the fact that he was $100 short affect his thoughts. And before sunrise some anonymous viewer put him over the top with a donation of $100. Dennis had not been to sleep but it didn’t matter. The excitement was crazy. He had been up since about 11 AM that day. This began as just a thought. Here is Dennis in line waiting to be called for his iPad. Later, he told me, the hardest part of his thought process was watching what he thought. Yes…keeping positive. Would there be enough donations? What if he wasn’t in the front of the line? What if this Apple store didn’t have any allocated? STOP!!! He said… He forced those thoughts out of his mind. He just knew he would get one. He felt it. Around 5:30 AM he started for the store. He started broadcasting at 6:00 AM. He waiting for a few hours while the line grew bigger and bigger. Apple provided Starbucks Coffee and Smart Water. Viewers from around the globe got in on the experience, too. At one point there were over 300 live viewers. The money had materialized. The next step was getting the item. At 9 AM they opened the doors. First, people who had reserved an iPad were allowed in and made their purchases. Then Dennis walked in and purchased his iPad. Here it is. I phoned him when I saw him getting it and told him to come to our house to have an “unwrapping” presentation. 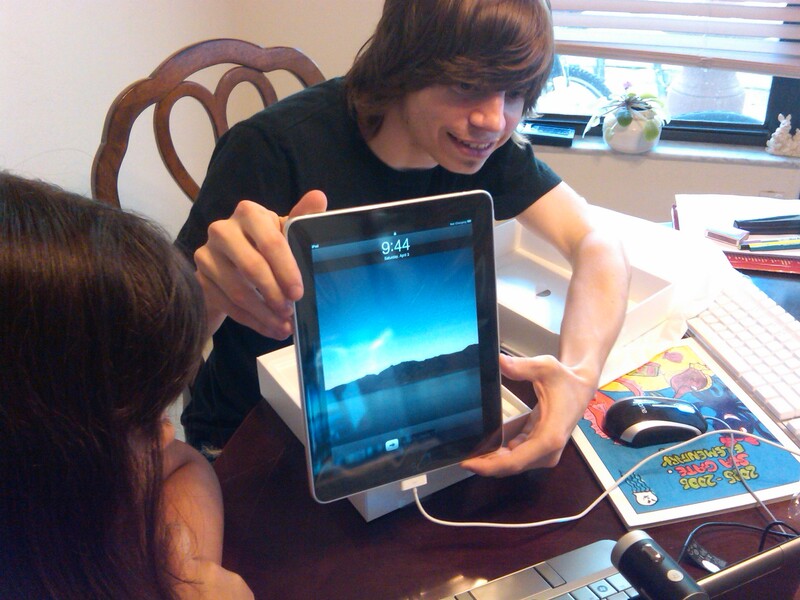 About 250 live viewers watched as Dennis unboxed his iPad. Hours before it was just a thought. That thought and a seed of belief that it could be turned into a physical item. Immediately you might think this was coincidence. He doesn’t. He knew it and trusted in his thinking. He thought more about getting the iPad than about not getting it. He entertained dozens of people broadcasting live the night before and they became part of the experience. I am happy for him and it turns a page in his life. These things are possible, even for things like an iPad. What are you thinking on today?